One of the nice things about being based in Washington, D.C. is the surplus of museums to visit frequently, especially the Smithsonian Institution. And now the Smithsonian National Museum of Natural History has a new exhibit: “Life in One Cubic Foot,” which will promote research conducted in one-cubic-foot slices of the ocean, soil, air, and so forth. This has People for the Ethical Treatment of Animals (PETA), the infamous self-described animal liberation “press sluts,” outraged—because it might cause kids to trap insects. Children should be taught to respect even the tiniest beetles and slugs, as they have feelings and a right to live free from needless interference and suffering […] PETA is calling on the Smithsonian to advise visitors of all ages to learn by observation and video and to live and let live. “Live and let live” is an interesting ethos for PETA to promote: When it comes to homeless pets, PETA wants to kill and let die. Since 1998 PETA has reported killing nearly 35,000 dogs and cats, a staggering 86.48% of the pets it has taken in. In addition, PETA is a strong advocate for killing more pets in shelters—they even ran an “undercover video” campaign against a shelter in upstate New York to encourage more shelters to kill pets. When PETA won’t spare the time and money to protect and care for homeless pets but does take the time to complain about everything, one must wonder what their real agenda is. “Total animal liberation” isn’t just convincing hippies and celebrities to “go vegan” or strip for advertisements. 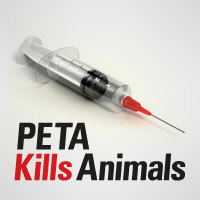 PETA wants a fundamental, radical restructuring of society from the anthill up.